A collection of all-new stories that see the Smurfs interacting with the many magical creatures who inhabit their enchanted land. Colorful adventures filled with kind monsters and wicked fairies! PIERRE CULLIFORD, born in Belgium in 1928, was the cartoonist known as Peyo. After leaving school in Brussels, he looked for a job and found two that caught his eye: dental assistant and illustrator. After arriving 15 minutes late for the dental assistant job, he was left with only one option! Peyo quickly found himself working with some of Belgium’s most talented cartoonists, including his lifelong writing partner Yvan Delporte. He eventually got the break he deserved when he started working for Le Journal de Spirou. Johan and Peewit were among his most popular characters. 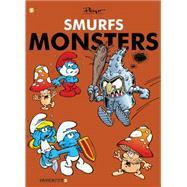 In 1958, The Smurfs made their first appearance and went on to become the world-famous characters we know and love today.